It was a just over a year ago that Steve Jobs died, exactly one day after the iPhone 4S was unveiled. As one of the most heavily scrutinised companies on Earth, much ink has been spilled over whether or not Apple (Nasdaq: AAPL) will ultimately endure without him. Few CEOs have or likely ever will deliver the type of returns to shareholders as Jobs did. He effectively reclaimed control of the company he co-founded in July 1997 after Gil Amelio was given the sack from Apple’s board. 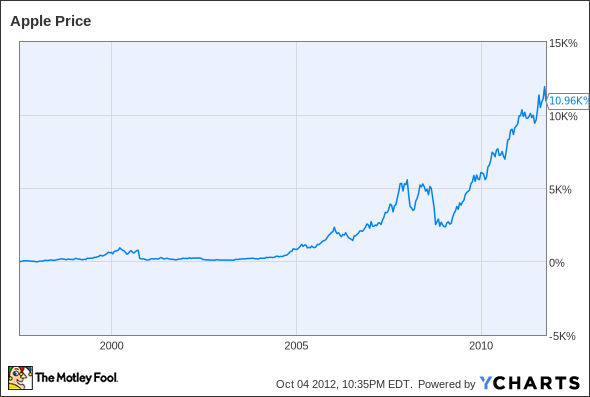 Jobs was made interim CEO that September, and wouldn’t officially become permanent CEO until 2000. That chart ends upon his death, even though technically he resigned as CEO in August 2011, handing the title over to Tim Cook. 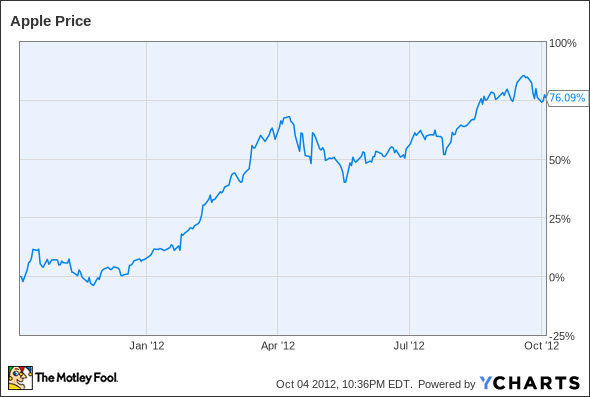 Still, any shareholder that stuck with him through the duration of his life landed a 10,960% gain — nearly a 110-bagger. In the year that’s passed since Jobs’ death, Apple has gone on to blow out its prior iPhone sales record by a healthy margin. 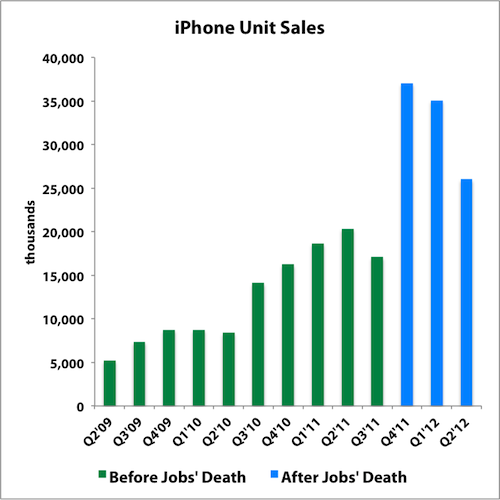 The fourth quarter saw 37 million iPhone units sold, the current quarterly record. A similar story played out with the iPad family. Cook has done quite the job in his time at the helm. His one-year anniversary was marked by a major legal victory against Samsung and the Google (Nasdaq: GOOG) Android camp, a win that would have made Jobs proud. Apple shares are now up roughly 76% since Jobs’ death, so investors have their answer right there: Apple certainly can endure without him, even though the company will never be precisely the same. It’s certainly a different Apple under Cook than under Jobs, but there’s little to worry about when it comes to the company’s long-term prospects. Over the past year, Cook has firmly put his stamp on the company’s culture and perception. Not only did he institute a dividend policy, something his predecessor was philosophically opposed to, but he’s also changed how Apple is perceived. Instead of being a one-way media black box, Apple now responds to press inquiries about its tax reduction strategies or controversies over Chinese labour. 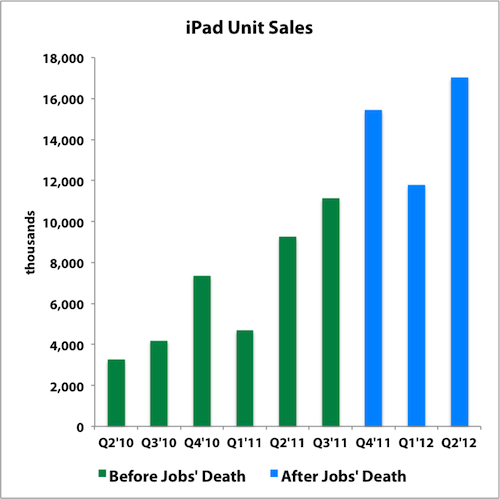 Without a doubt, Jobs’ passing was a loss for the world, but that doesn’t mean technological advancement must halt. If anything, Jobs has inspired an entirely new generation of visionary CEOs, like Facebook‘s Mark Zuckerberg, who clearly looked up to Jobs as a friend and mentor. Steve Jobs will never be forgotten, for his accomplishments will withstand the test of time.